Manufacturer: Dantona. For all your power needs, DANTONA has a solution. 12V DC output only supports Dewalt 20V lithium battery. DC12V output, can heat the coat. Two USB ports for a variety of small electronic devices. The output connection is a standard 5.5/2.1 mm barrel power jack. One of the 5V USB output is rated for 1 amp and the other is rated for 2.1 amp. They can be used for charging the cell phone and or other USB powered device such as Bluetooth speaker. 12V DC output only supports Dewalt 20V lithium battery. Two USB ports for a variety of small electronic devices. 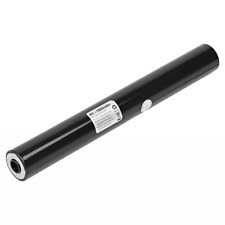 Dyson 31 34 35 Battery 22.2 Volt 2000mah 45wh . Monarch FR3 Push To Start Charger For Nova Strobe 115VAC ! WOW ! Commander E5-TBc Battery Charger ! NOP ! Commander S4/5-TBc Charger For Infrared Remote Control ! WOW ! The Bosch GBA12V30 12 V Max Lithium-Ion Battery is the most compact 3.0 Ah battery in its class. The 12 V Max battery is 100% compatible with all Bosch 12 V Max Lithium-ion tools. 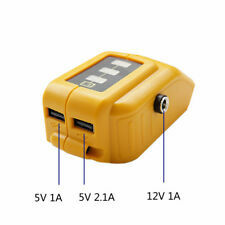 (1) GBA12V30 12V Max Lithium-Ion 3.0 Ah Battery. 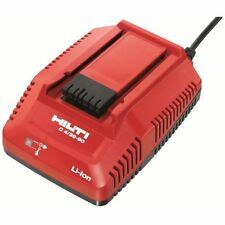 Fully compatible with all Hilti 12V (with adapter), 14V, 22V and 36V Li-ion batteries. Compatibility: 7.2 to 36 Volt Lithium Ion Batteries. Battery Test Function: No. Color Family: Red. Electrical protection class II (double insulated). M18 XC 5 amp batteries. Generic B2-6 Spark Plug Wire ! WOW ! MILWAUKEE 48-11-0100 2.4 VOLT BATTERY. FOR USE WITH MILWAUKEE 2-2/5-VOLT CORDLESS TOOLS. 1-1/3 AMP-HOUR STICK STYLE BATTERY. 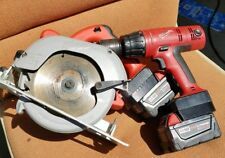 ALL POWER TOOLS ARE USA 110/120 VOLT. YOU MAY NEED AN ADAPTER/CONVERTER TO USE THESE TOOLS IN YOUR COUNTRY. Milwaukee 50-59-2404 M12 Li-ion Battery, M12 Battery Holder and M12 Charger Kit. Condition is New. Shipped with FedEx SmartPost. (LOCKS in place NO modifications to tools) Pictures show the tools I own that it fits. Push until the battery locks in place. There are a lot of other adapters out there. I have used a couple of them from China and you lose about 1/2" of the cutting pass with the 5.0 battery. (LOCKS in place NO modifications to tools) Pictures show the tools I own that it fits. Push until the battery locks in place. 1 adapter that does it all! Complete adapter ready to rock and roll. Insert tool first all the way(if the tool isn't all the way in the battery will not go in all the way). (LOCKS in place NO modifications to tools) Pictures show the tools I own that it fits. For use on the Milwaukee V18 tools(older) Will not work on M18 (newer tools). Dewalt has lot of different batteries I have only used the two listed. Ridgid 130252003 Battery 14.4-Volt Ni-Cd. This part replaces obsolete part #: 200901011. RIDGID PARTS. Battery Type: Ni-Cd. feature and select the ?. button at the top right of your first item. Why Repair?. MILWAUKEE PARTS. Compatible with all models of M12 heated gear to provide power to gear, portable charging of M12 batteries and device charging functionality. Provides convenient, compact charging of all M12 batteries with micro-USB cable from AC outlet or USB power source (3 ft. cord and wall plug included). Trending at C $72.94eBay determines this price through a machine-learned model of the product's sale prices within the last 90 days. DJI WB37 Intelligent Battery. Brand New Includes Manufacturer's Warranty . . Product # CP.BX.000229 . . The DJI WB37 Intelligent Battery is a compact LiPo battery designed specifically for the CrystalSky monitor and Cendence remote controller. One battery offers four to five hours of operating time for a 7.85" CrystalSky monitor, five to six hours for a 5.5" CrystalSky monitor, and four hours for a Cendence remote controller. Battery Type: Lithium-ion. Battery Style: Slide on. I may not know everything about each item. The pictures are of the item (unless stated otherwise), get more details from them. Performs just as well in cold weather as in normal temperatures. Note: OUR BATTERY ONLY COMPATIBLE WITH GreenWorks 40V G-MAX Tools. (NOT for Gen 1) GMAX batteries (Current version Greenworks) are NOT INTERCHANGEABLE with Gen 1 batteries (Early version Greenworks). Specifications: Voltage: 40V Capacity: 5000 mAh Battery Type:LG or Samsung Li-ion Cell Replacement Part: G-MAX Batteries 29462 and 29472 Only Compatible Models: (Use "Ctrl F" to search) GreenWorks G-MAX 40V: 20302, 20672, 20202, 20322, 20262, 20292 21332, 21362, 21242, 21302 22262, 22332, 22342, 22272 24252, 24282 25312, 25302, 25322, 25223, 2500502 26272 27062 2100702, 2100202, 2501302 ST40B410, BA40L210, STBA40B210 Battery only compatible with GreenWorks 40V G-MAX Tools. (NOT for Gen 1) Can NOT Compatible With GreenWorks 29282 Model 29662!. 18-36-Volt Lithium-Ion 4/36-90 Compact Battery Pack Fast Charger FREE SHIPPING!! DeWalt DC9000 Heavy-Duty 36V/28V 1 Hour Charger- FREE SHIPPING NEW SEALED PAK!!! DEWALT DCB361 36VOLT LITH-ION BATTERY PACK-FACTORY SEALED-LATE 2018 DOM-NISP!!!! 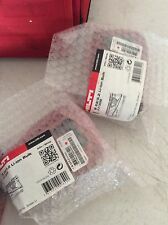 HILTI CPC B 18/2.6 LITHIUM-ION BATTERY, NEW SEALED BOX-LATE 2016 FREE PRI-SHIP! MILWAUKEE GENUINE 48-59-2401 M12, 12VOLT CHARGER-NEW IN SEALED PAK FREE SHIP!! !